Taliesin is the home, studio, school, and 800-acre estate of Frank Lloyd Wright (1867-1959). Located in the Driftless Region of southwestern Wisconsin near Spring Green, Taliesin is the name of Wright’s 37,000 square foot home as well as the estate that includes buildings from nearly every decade of Wright’s career from the 1890s to the 1950s. 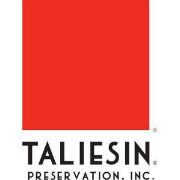 In 1976, Taliesin was designated as a National Historic Landmark.